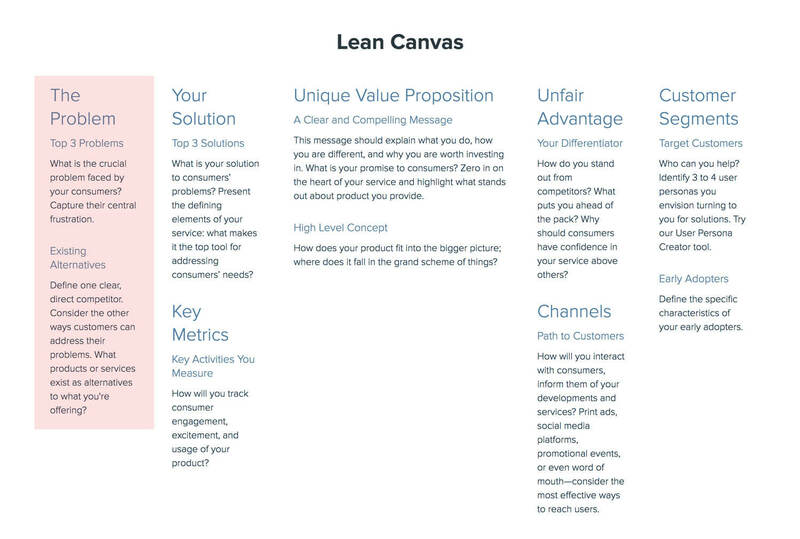 The Lean Canvas is a great starter tool to present the heart of your business idea on a single page. In 9 compact cells, the Lean Canvas asks you the vital questions to help you form a real business case for your grand vision. This guide will lead you through these sections as you launch your startup. You can create your Lean Canvas on any medium, even a piece of paper. Xtensio’s free online editor and live collaboration technology helps you customize your Lean Canvas and gives you maximum control over how to share your core business concepts. Create your Lean Canvas now for free! 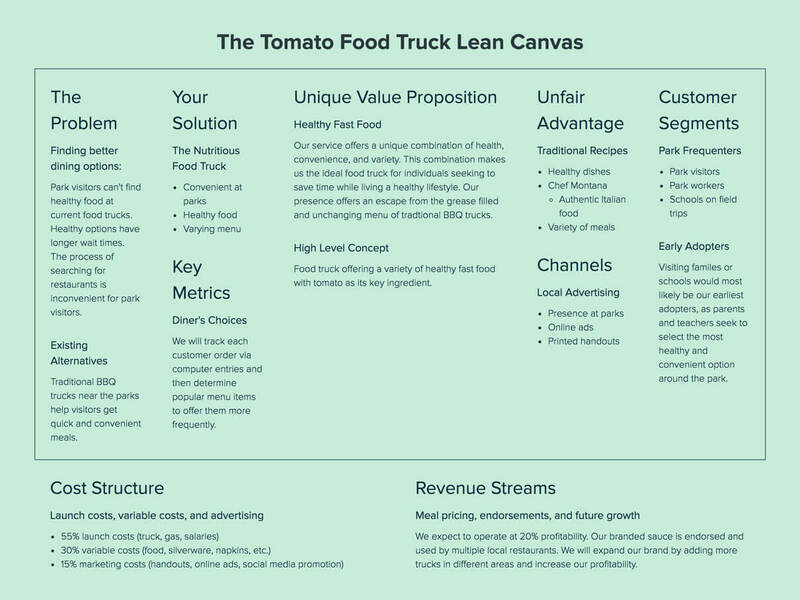 Lean Canvas, inspired by the Lean Startup movement, was originally created by LEANSTACK to generate simple and sleek representations of business operations. 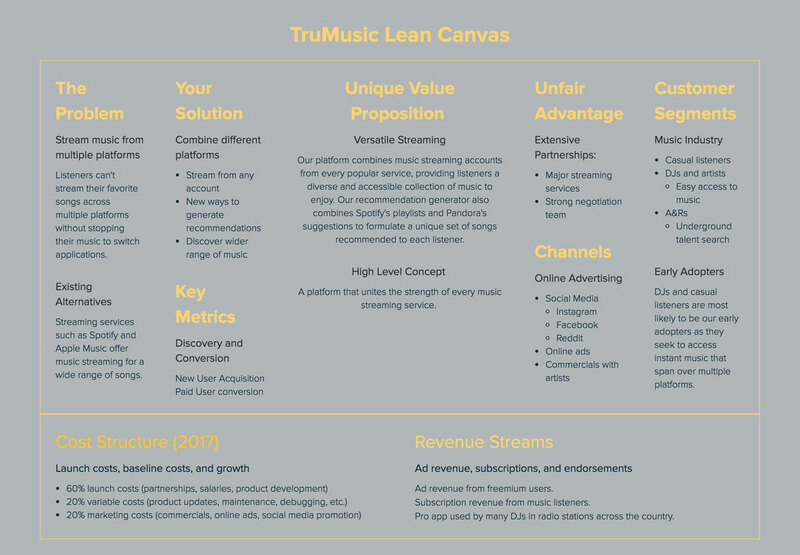 This version of the Business Model Canvas Template allows your startup to present its unique solutions and market competition before fully launching a product. 1. From Idea to Business. 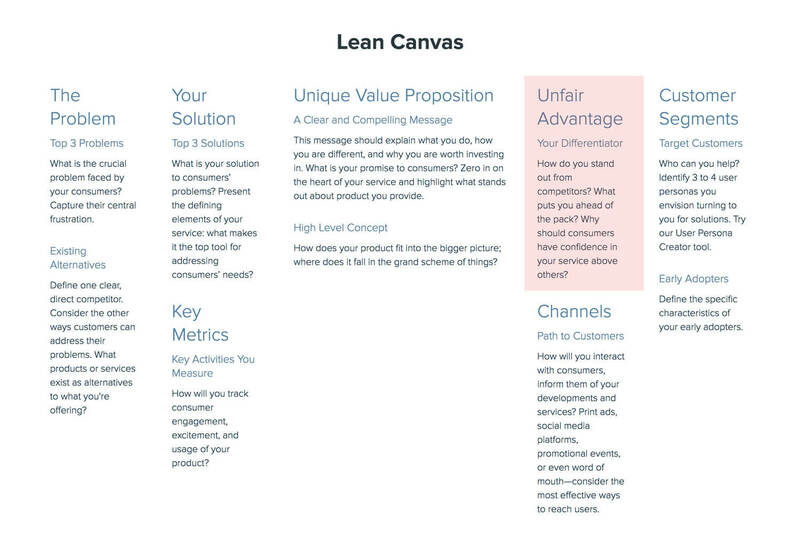 Designed for entrepreneurs, the Lean Canvas allows you to map out the key foundations of your startup. It prompts you to analyze and prioritize your goals through the beginning stages of your business. 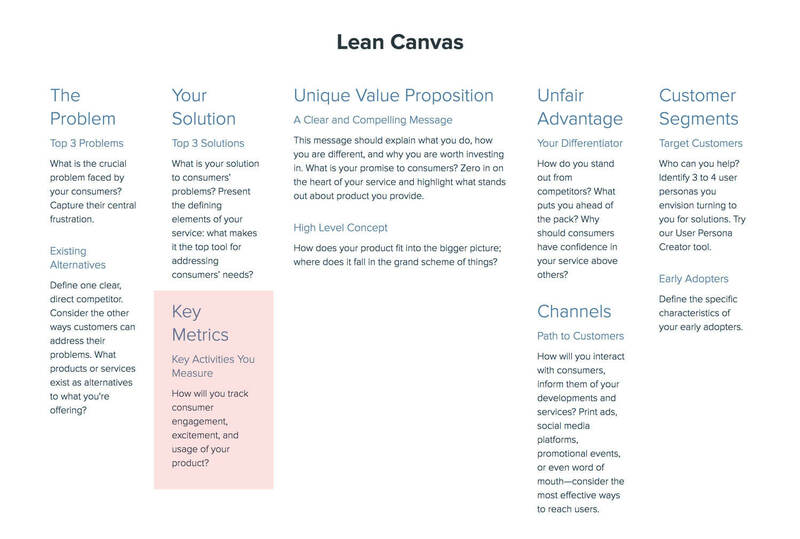 From the problem to key metrics, the Lean Canvas helps you navigate through the uncertainty that comes with starting a new business. 2. Market Analysis. 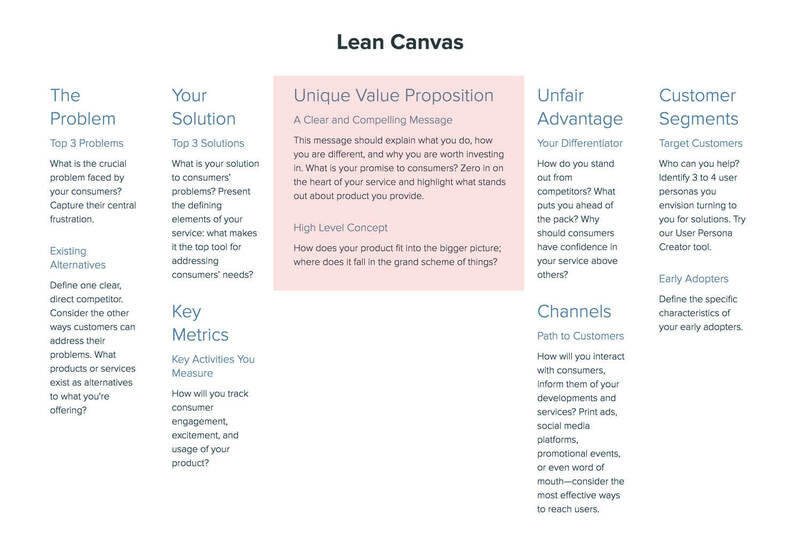 The Lean Canvas helps you identify your advantages over other market competitors, making it easier to highlight ways to utilize those advantages. It also generates a blueprint for your startup to establish a consumer segment based on your solutions to the presented problem. 3. Launch and Growth. 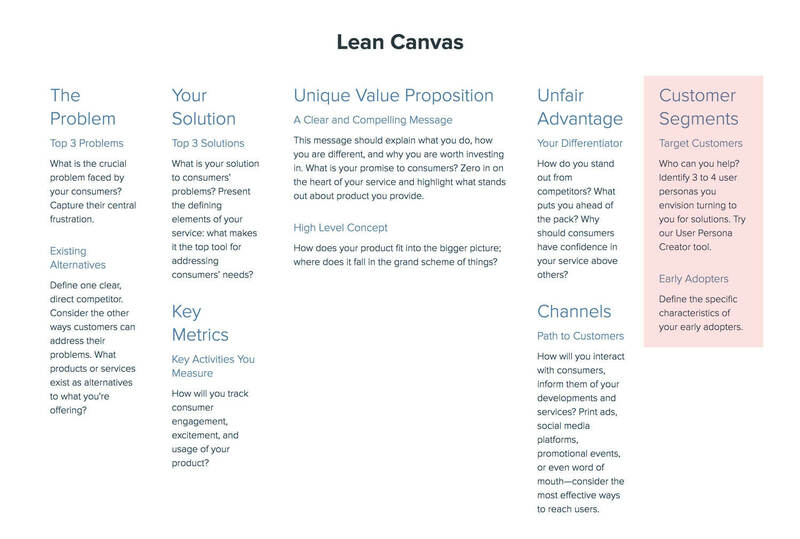 Startups revisit their lean canvas as their company evolves, pivots and grows. The tool helps you maintain the focus of real-life operations on your unique value proposition. 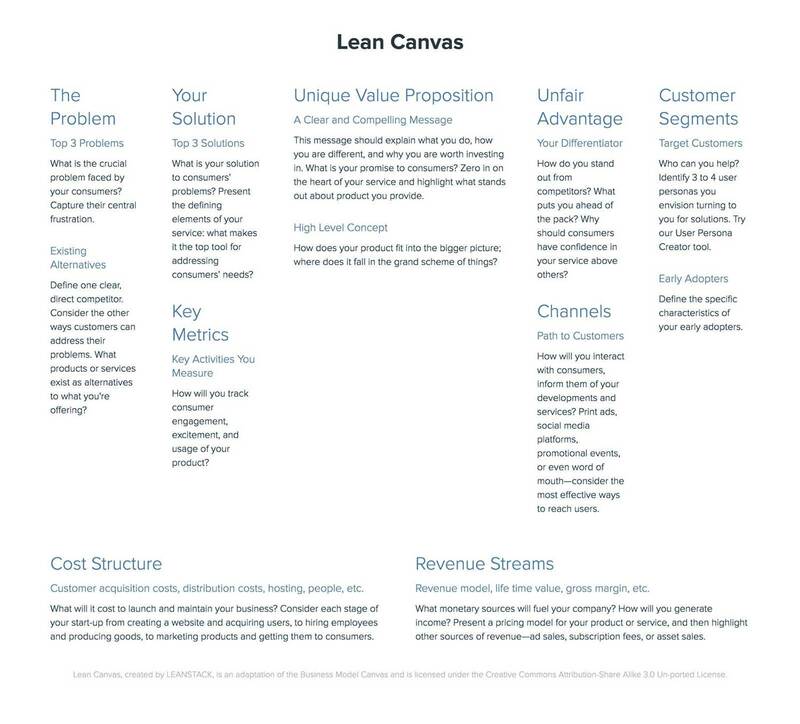 Below are tips and tricks to help you fill out the Lean Canvas. Put yourself in your customers’ shoes and describe up to 3 problems they face. Try to understand their unique needs and challenges. These problems will lead to working business models. Careful! Identifying the wrong problem is a problem. For instance, you might believe your SaaS platform is struggling because your logo and copy aren’t engaging, but the real issue might be that users don’t understand why they need your product. If you skip this step, you risk wasting time and energy on non-existent problems. If certain issues are raised by multiple consumers, you can begin to prioritize solutions. Interact with your platform, product or service yourself, as if you were a customer. Consider each step of your “user” experience and ask yourself what’s working and what’s not. Careful! Avoid writing down high-level problems. These tend to be obvious, large-scale, and difficult to achieve. Instead, focus on specific problems that merit concrete, measurable solutions. How else can your customers address their problems? What products or services already exist as alternatives to yours? This section is where you identify competition. Who are you up against? Research your competition using multiple methods. Ask target customers about other products or services they’ve explored or used. Utilize search engines, social media and trade publications to become an authority on your industry. Xtensio’s Competitive Analysis Template will help you get started on your initial research and establish a clear picture of where you stand in the market. How is your product solving the problem? Define the top three features and capabilities your product or service offers to solve your customers’ problems. Careful! 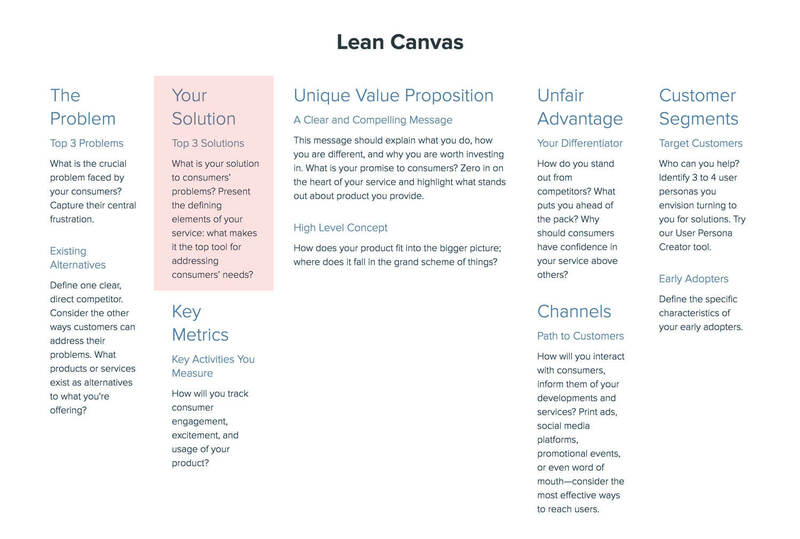 You might think you know the best part of your product or service, but completing the previous sections of the Lean Canvas may prove otherwise. Your users will ultimately determine which aspects of your product they’re most eager to use and will subsequently find most beneficial. Brainstorm 10 features and capabilities of your product or service. Consider the strengths and flaws of each and whittle your list down to the top three. 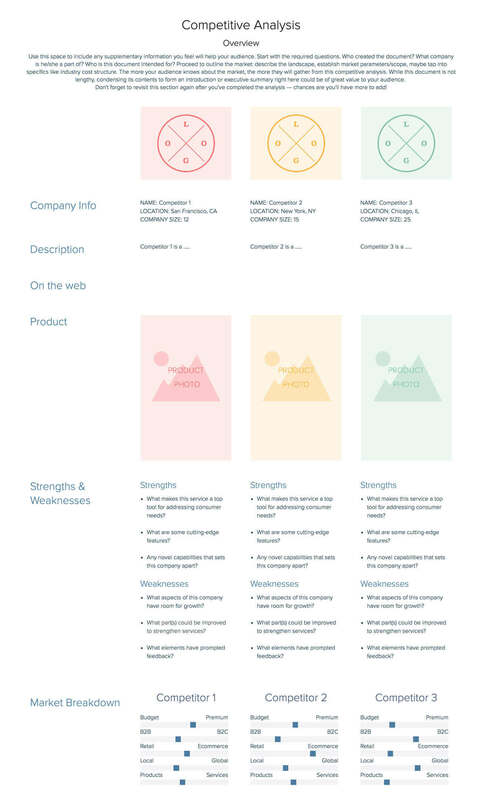 You can also use other strategy exercises like completing the brand positioning canvas to help define your solution. What activities drive your product usage? Which statistics indicate how well your company is doing? What numbers best underline opportunity for development? Key Metrics allow you to track and evaluate the success of a specific business process. A Key Metric could be daily visitors to your site, the number of company emails opened by consumers per hour or the monthly sales of a specific feature. Every sector of a business has specific metrics that should be monitored. Fill in this section of your lean canvas with the metrics that are most critical to the problems you’re trying to solve. Pro Tip: The most useful metrics provide a great deal of insight and spur short-term, low-cost action. Who is your intended audience? What type of person do you anticipate benefiting the most from your product? Is there a group of individuals you anticipate itching to sign up for your service? Before you complete this section, run a more in-depth analysis of your target audience. 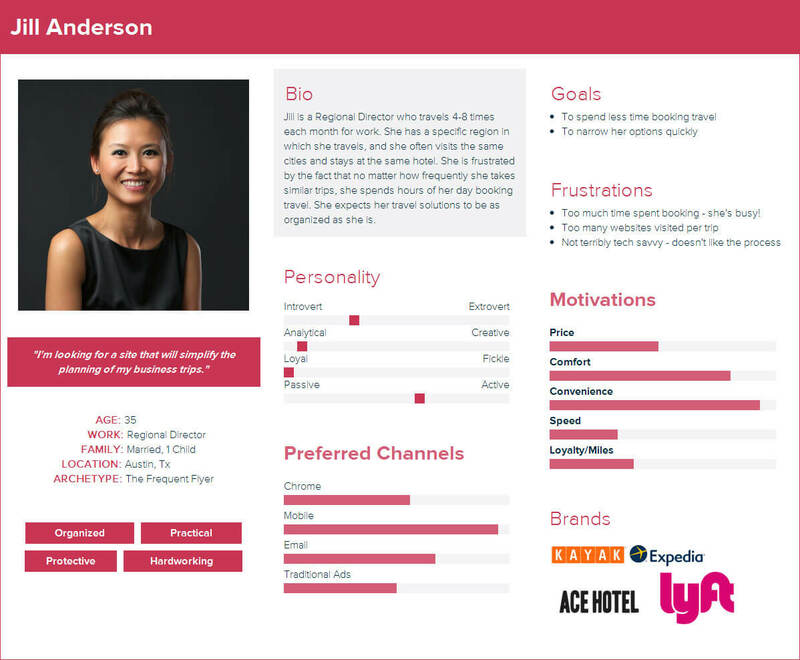 Define 3 to 4 specific user personas from your early adopter groups. 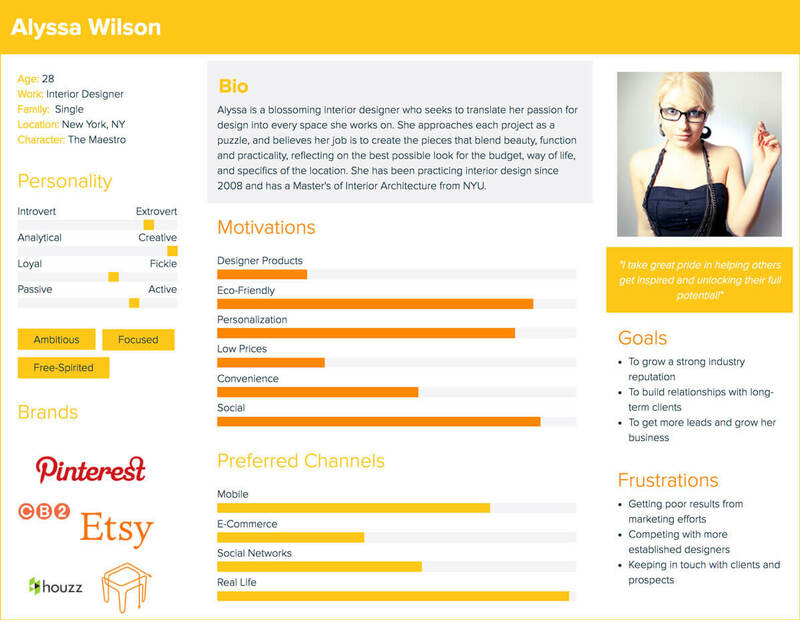 Xtensio’s User Persona Creator will help you paint a clear picture of who your potential customers are as people. Inside Information: In-depth knowledge or skills that are critical to the problem domain. Basically, this means being well positioned to understand a problem, create a solution, and continue to innovate faster than others. Personal Authority: If you’re a scholar in a specific field, an award-winning builder of a certain product, or an expert on given services, you hold sway over competitors. Community: If you have a vast network of customers and partners at your fingertips, you’re in a good position to make big strides. Internal Team. Do you have a dream team? If your office is loaded with unique talent, you’re set to compete. Reputation. Have you built up a following, a name that people instantly associate with proven success? A proven and popular brand reputation is a major advantage. How will consumers come into contact with your brand? Where will they first learn about your company? Will it be through social media? If so, which sites? Will it be through advertising? If so, where will these ads exist? You can use the ecosystem mapping template and create a strong content strategy to help you define what channels you’ll reach customers at different times. Careful! The bullets above are meant to spark your thinking about possible channels. However, when you fill in this section be specific about your consumer touchpoints. The Unique Value Proposition (UVP) should be a single clear compelling message that captures the essence of your product and the solutions it offers your target audience with respect to the problems you are trying to solve. 1. Be easy to understand in about five seconds. 2. Communicate the benefit a customer receives from using your products and/or services. 3. Explain how your offering is different from and better than competitors’. Careful! A UVP is not a slogan. Melts in your mouth not in your hand (M&M), Just Do It (Nike), Belong Anywhere (Airbnb) — these are slogans, not Value Propositions. Don’t be unique for the sake of being unique. Adding a quirky flaw (a specific colored product, a cookie with every purchase!) to differentiate your company is useless. If you want to stand out in your field, your company must have something notable that sets it apart. Avoid hype (never seen before amazing miracle product! ), superlatives (best, most-powerful!) and jargon (value-added interactions and top-notch assets) when writing your UVP. How does your product fit into the bigger picture? High-Level Concepts are perfect for investors describing your company to partners, fans spreading the word about what you’re up to, and the press covering your business in an article. Careful! People should be familiar with the companies and or analogies used in your Concept. If you refer to your business as the love child of an obscure corporation and off-brand mythical creature, it will mean nothing to no one. Try to consider all your costs of doing business (ie. customer acquisition, distribution, etc. ), and make sure your customer lifetime value exceeds your acquisition cost. 90% of new businesses fail because they do not properly consider the cost of launching and running their businesses. Tip! To ensure you don’t accidentally overlook a cost, consider how each section of your lean canvas might drive business expenses. For example, what is the cost to create, develop and launch services promised in your value proposition? What is the cost to identify target consumers, connect with users, and keep them informed of your brand? When filling in this section, take time to reflect on all possible cost scenarios. Revenue streams are the lifeblood of companies. What sources of income keep your business churning? 1. Asset Sales: Customers pay to purchase ownership of your product, be it a book, camera or coffee mug. 2. Usage Fees: Payment for the number of uses of your product such as the number of minutes spent on a phone or nights in a hotel room. 3. Subscription Fees: Consumers pay for unlimited usage of a product for a given time period like a monthly gym membership or a yearly newspaper subscription. 4. Delivery or Installation Fees: Consumers pay for the installation and/or delivery of your product or service. 5. Advertising: Companies pay you to advertise their product or service on your site. The Lean Canvas template is not set in stone. Like other Xtensio tools, it should be repurposed, revisited, and revised to suit your specific needs. 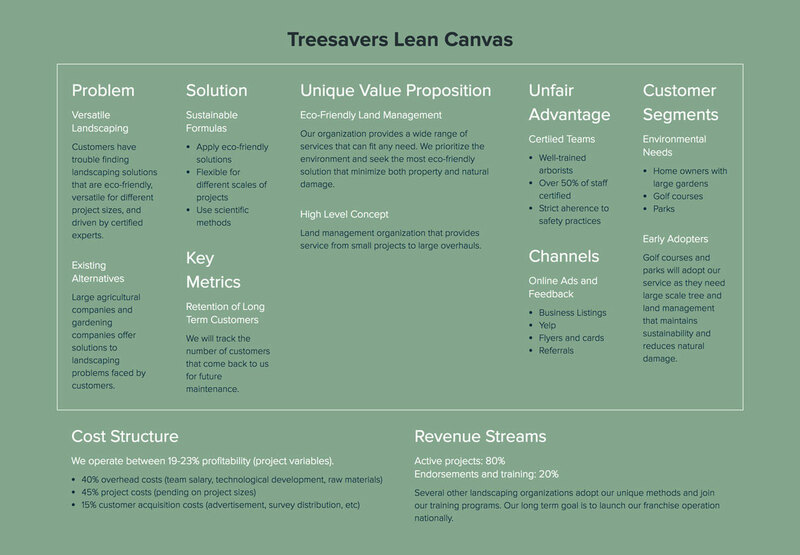 Many companies revisit Lean Canvases every time they prepare to release a new feature or tool. This helps internal teams understand and hone in on the central customer problem their updates are resolving. 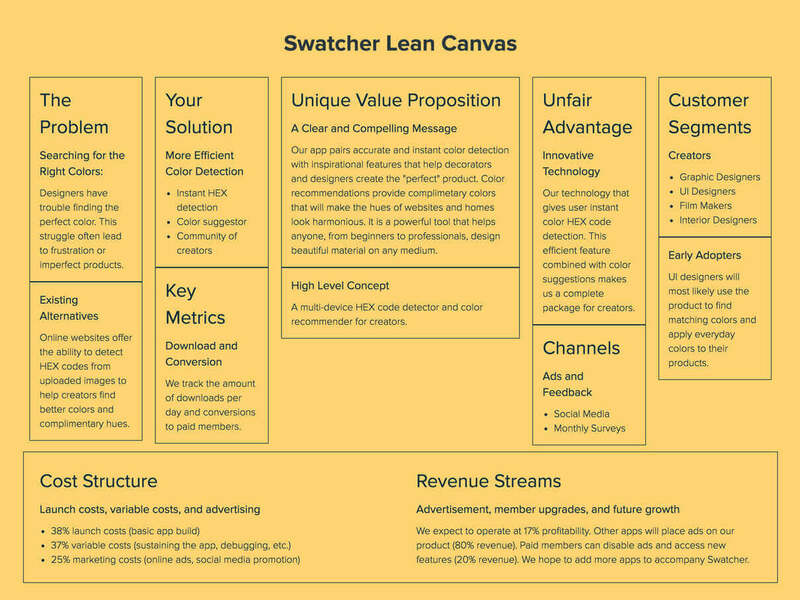 The Lean Canvas exercise helps drive organizational focus down to the right feature-set (solution), metrics, and customer segments which in turn aligns sales, marketing, design and development efforts.